Hi, I need an export (CSV) report for all enrolled devices with their IMEI number. Is it possible? 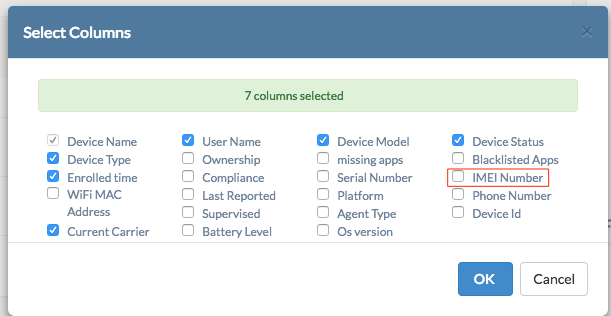 You can export information of enrolled devices as CSV file from Reports > Enrolled devices. But the field for IMEI Number won’t be there by default. You can add that column by clicking on the edit option there. Check the box for IMEI Number > Click OK.
Now Click on Export > CSV. Enrolled devices report will be downloaded as CSV file.